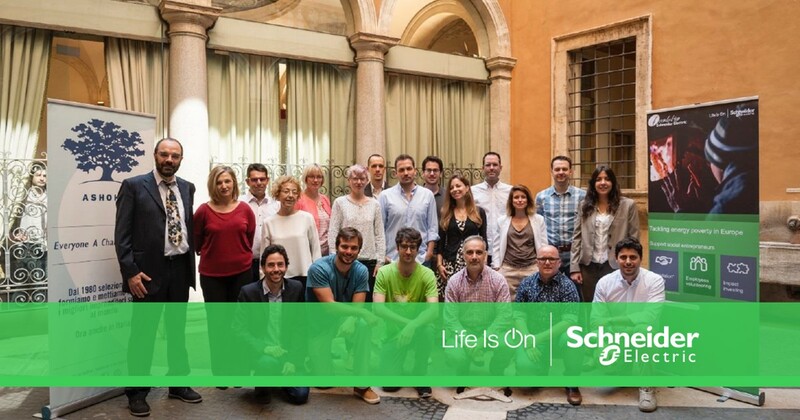 Ashoka and the Schneider Electric Foundation, in partnership with Enel, recently awarded the 5 most innovative solutions to tackle fuel poverty and promote energy sustainability in Europe. Fuel poverty has become a major problem in Europe. There are between 50 and 125 million people who struggle every day to ensure adequate heating, light, and cooking power in their dwelling at an affordable price (European Parliamentary Research Service). This has a severe impact on their health and wellbeing. Creative and systems-changing solutions are needed to transform this issue in an opportunity for these people to thrive. After a successful Call for Projects, which received interest from over 40 social innovators, 15 winners were announced in the 2017-2018 “Social Innovation to Tackle Fuel Poverty” program during the 23rd session of the Conference of the Parties (COP23) in November 2017. The 15 winners represent a diverse cohort of social innovators from Germany, Greece, Italy, Portugal, and Spain, all committed to tackling fuel poverty and promoting energy sustainability. The 15 winners engaged in an intensive 12-week advisory process that helped them to craft an effective strategy to scale up their impact. On 24th May 2018, the 15 winners gathered in Rome, for the two-day final European Summit. Five projects from five different countries, with the highest potential for social impact were awarded and thanks to the Schneider Electric Foundation, the winners will benefit from additional financial incentives and investments, technical competences, and other forms of in-kind support up to 10,000 euros. From Greece: Argyro Stavroulaki, Deputy Director of EKPIZO – a customers’ association “The quality of life” to protect consumers rights and improve their quality of life. Its lobbying efforts aim to encourage the government and the Energy Regulatory Authority to implement EU and national legislation. From Italy: Alberto Gastaldo, CEO of Energia Positiva – a cooperative enabling citizens to become prosumers of different clean energy production systems (e.g. photovoltaic, wind turbines, and hydroelectric power) and therefore decreasing the costs associated to meeting their energy needs. From Spain: Cecilia Foronda, Climate Change and Energy Manager at ECODES – an organisation that runs the project “No home without energy”, which offers a technological solution to overcome fuel poverty. Its website offers a questionnaire that manages to gather social, household, and energy contract data from vulnerable people and returns a personalized report with advice on how to reduce energy consumption and energy costs. From Portugal: Rita Marouço, from Coopérnico – a green energy cooperative that combines sustainability, ethical investment, and social support. Its members collectively invest in solar power projects that are owned by the cooperative and installed on the roofs of social support organisations that often struggle to cover their own energy costs. These two days of powerful exchange elicited experiences that helped the social innovators to solve critical issues as well as begin to build connections and opportunities to collaborate for a common cause. Read more about Schneider Electric Foundation here.